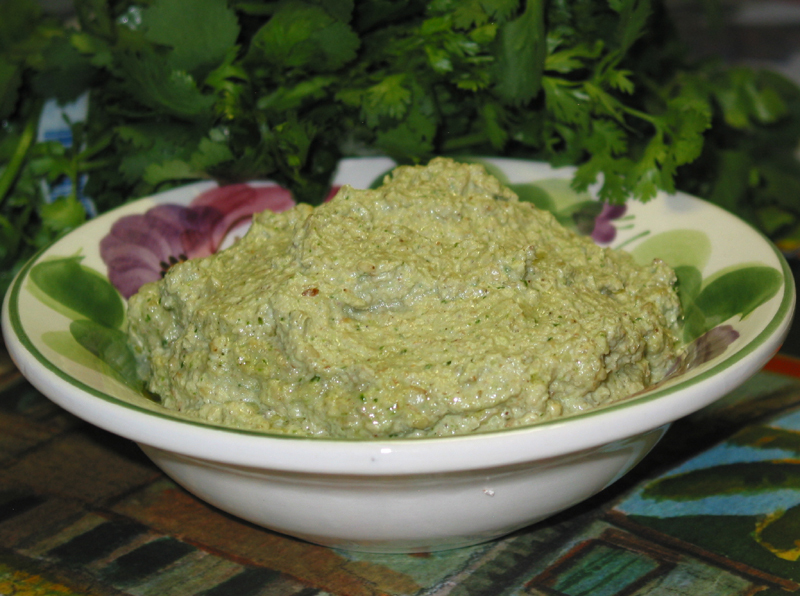 This dip is a delicious and healthy spread for bread, it makes great hors-d’oeuvres and is a delicious condiment to serve with Falafel. Tahini is originally from Morocco, but is found in a lot of Middle Eastern and Mediterranean dishes. In our house, it has replaced the butter we use to put on our bread. Lightly toast sesame seeds in a dry skillet on medium heat for 1-2 minutes. Stir the seeds constantly to prevent burning. After Sesame seeds have cooled a bit, put them in your blender with garlic, onion, hot pepper and cilantro. Coarse chop cilantro to make blending easier. Then add water gradually. Add just enough to blend the ingredients to a creamy consistency. Be sure the seeds are getting ground up. If you add too much water too fast, the tahini will be watery and the seeds will still be whole. After blending well, place dip in a serving dish. Drizzle with olive oil (3 tablespoons) and add salt to taste.